abortion, and uterus on the left side. of uterus on the left side, usually with blood bleeding. Abortion is the termination of pregnancy before the fetus becomes viable. Viability is usually reached at 20 weeks and later of pregnancy, when the embryo [infant] weight more than 500 gts; with proper care in neonatal period, the infant may survive. Abortion may occur before the 16th week; about 75 % of abortions occur before the 16th week; of these, 75 % occur before the 8th week. The relative incidence of abortion is highest in early adulthood and just prior to the menopause. About 12 % of all pregnancies terminate in spontaneous abortion. What are the categories of abortion? 1. Spontaneous abortion [miscarriage]: pregnancy loss before 20 weeks gestational age. 2. Complete abortion: abortion with complete expulsion of all products of conception [POC]. 3. Incomplete abortion: abortion without complete expulsion of all POC ;fetal or placental components remain in the uterus. 4. 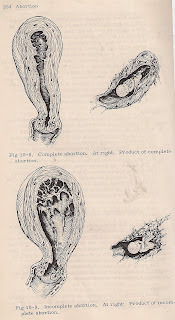 Threatened abortion: bleeding from the uterus [as seen on visualization of cervical os [hole] without cervical dilatation and with or without contraction before 20 weeks gestational age; no expulsion of POC. 5. Inevitable abortion: bleeding from the uterus with cervical dilatation with or without perceived contractions before 20 weeks’ gestational age; no expulsion of POC. 6. Missed abortion: fetal death before 20 weeks’ gestational age without expulsion of POC. 7. Recurrent abortion: three or more consecutive spontaneous abortion. 8. Induced abortion: Legal abortion, pregnancy termination by medical or surgical means for therapeutic or elective reason; illegal or criminal abortion against the law in a few countries. What is the cause of abortion? First trimester: Congenital absence of the embryo is common. Cleavage defects of the ovum, absence the chorionic cavity, and a hypoplastic trophoblast are found occasionally, many pregnancies are expelled so early that deficiencies such as hydatidiform mole cannot be determined accurately. Second trimester: The major fetal causes of abortion are syphilis [in developing countries], shallow circumstanced implantation of the placenta. Erythroblastosis and other fetal anomalies are less frequently responsible. Indirect trauma: Abortion may be induced by electric shock [lightning or power-line contact]. Direct trauma: Concussion of the lower abdomen after the 4th month may injure the uterus, causing placental separation. Abdominal surgery may excite uterine irritability and induce abortion. Infections:Rubella, syphilis, brucellosis, or toxoplasmosis increases the likelihood of abortion. Diet: Avitaminosis C and B-complex, or severely deficient protein or caloric intake. Endocrine: Maternal hypothyroidism , diabetes mellitus . Toxic: Lead poisoning, drug substances such as chloroquine, aminopterin, methotrexate and anesthetic gases. Uterocervical: Incompetence of the cervix as a result of previous pregnancies and lacerations cause second trimester abortion. Abortion is classified clinically as  complete,  incomplete or inevitable,  missed,  threatened abortion. Complete abortion:All products of conception [POC] is expelled. When complete abortion is impending, the symptoms of pregnancy often disappear and sudden bleeding begins, followed by cramping. When the entire conception has been expelled, pain ceases but slight spotting persists. Incomplete or inevitable: In incomplete abortion portions of the conception have already passed; in inevitable abortion, , evacuation of part or all of the conception is momentarily impending. Bleeding and cramps do not subside. Abortion is inevitable when 2 or more of the following are noted [Brown]: moderate effacement of the cervix,  cervical dilatation more than 2 cm,  rupture of the membranes,  bleeding for more than 7 days,  persistence of cramps despite narcotics,  signs of termination of pregnancy. Fever and generalized pelvic discomfort indicate infection. Retained tissue is evidenced by a stopper tissue in cervix and enlarged, boggy uterus. Missed: In missed abortion the pregnancy has been terminated for at least one month but the conception has not been expelled. Symptoms of pregnancy disappear. There is a brownish vaginal discharge but no vaginal bleeding. Pain and tenderness are not present. The cervix is semi-firm, the uterus becomes smaller and irregularly softened, the adnexa are normal. In threatened abortion the viable gestation is in jeopardy but the pregnancy continues. Bleeding or cramping in early pregnancy, and closed cervix, without cervical dilatation, no expulsion of products of conception. Urine, the Friedman and Aschhem-Zondek pregnancy tests are negative or equi- vocally positive. Hormones:  Chorionic gonadotropin is produced by the cytotrophoblast. It is present in the urine in diminished amounts in failing pregnancy; absent after pregnancy ceases. Estrogen: A falling blood or urine estrogen titer may signify impending abortion. Progesterone: during first trimester the principal source of progesterone is the corpus luteum. Thereafter, the principal source is the chorioplacental system. Pregnanediol [the major catabolite of progesterone] drops precipitously in abortion. Blood : If significant bleeding has occurred, blood studies will show anemia. If infection is present, the white blood count will be elevated [12-20 thousand].The serum Friedman test is usually negative. Hemorrhage is a major cause of maternal death. Infection [septic abortion] is most common after criminally induced abortion, death results from salpingitis, peritonitis, and septicemia or septic emboli. Infertility may result from tuba uterine occlusion .Perforation of the uterus, accompanied by injury to the bowel and bladder, hemorrhage, infection and fistula formation, may occur during dilatation and curettage because of the soft and vaguely outlined uterine wall. Successful management of abortion depends upon early diagnosis. Every patient should recipe a general physical [including pelvic] examination, and a complete history should be taken. Laboratory studies should include cultures of cervical mucus to determine pathogens in case of infection, antibiotic sensitivity tests, blood typing and cross-matching, and a complete blood count. 1 ml/500 ml of 5 % dextrose in water I.V., or 0.5 ml I.M. every 30 minutes for 2-4 doses, to contract the uterus and limit blood loss and aid in the expulsion of clots and tissues. Ergonovine [Ergotrate] should be given only if the diagnosis of complete abortion is certain. Give anti-shock therapy, include blood replacement, to prevent collapse after hemorrhage. Specific measures: Endocrine therapy has theoretical value in about 15 % of abortion, due to maternal hormonal deficiencies. Progestogen therapy, such as dydrogesterone [Duphaston] 10-20 mg orally daily is reasonable for patients who are threatening to abort but not for patients who are aborting. What is the treatment of missed abortion? There are 2 option:  Prostaglandin Dinoprostone [Cervidil] vaginal: 20 mg suppositories .It is approved for inducing abortion in the second trimester of pregnancy, for missed abortion, for benign hydatidiform mole, and for ripening of the cervix for induction of labor in patients at or near term.Dinoprostone stimulate the contraction of the uterus throughout pregnancy. Dilatation of the cervix and curettage of the endometrial cavity [D and C]. General measures: Place the patient at bed rest and give sedatives to allay uterine irritability and limit bleeding. Coitus and douched are contraindicated. Surgical measures:  Dilatation and curettage for possible retained tissue. Start an oxytocin [Pitocin] intravenous drip prior to surgery to avoid uterine perforation. Uterine packing to control bleeding and promote separation and evacuation of fragments. Remove packing in 6-8 hours to allow drainage. What are potential treatments for recurrent pregnancy loss? Treatment of complications:  Uterine perforation, observe for signs of intraperitonial bleeding, rupture of the bowel or bladder, or peritonitis. Exploratory laparotomy may be necessary. Pelvic thrombophlebitis and septic emboli are critical sequel. Consider antibiotics, anticoagulants, and ligation of the internal iliac veins and vena cava.